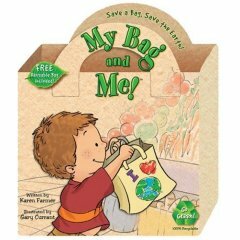 My Bag and Me!, written by Karen Farmer and illustrated by Gary Currant, is a cute rhyming board book about the benefits of using reusable shopping bags. The little boy in the story has his own shopping bag he takes to the store. He also reminds his mother to do the same. Then it’s off to the checkout where we’ve all been before. I hand over My Bag and say, “Paper and plastic no more!” We feel really good when our shopping is done. We’ve saved so many bags by using this one! My Bag and Me! comes with a reusable, small shopping bag. My only criticism is that the bag is made from Tyvek, a Dupont product. Dupont doesn’t exactly have a clean environmental record, and Tyvek is not as long lasting or washable as a cloth shopping bag. Furthermore, the bag and book both claim to be 100% recyclable, although I’ve never seen Tyvek accepted at a recycling center, and neither bag nor book are made from post consumer content. 500 billion paper and plastic bags are used each year globally! These “free” bags actually cost $4 billion dollars a year, and thus consumers pay the price for them in other ways. It is also staggering to consider that it takes 1,000 years for a plastic bag to decompose, and we have all seen the litter they create. I think that giving your child their own reusable shopping bag is a great idea! My daughter immediately asked if she could take the Tyvek bag to town with us today and use it for her shopping. She also filled it with goodies from our kitchen and pretended to be on a shopping spree. I think I will get her a cloth shopping bag that she can decorate as her very own. Just like the character in the book, if she remembers her bag, it is more likely that I will remember to use mine and not leave them at home. yep, I regularly forget my bags and my reusable coffee cup, but I’m getting better! That is just so funny, just today I bought this book thinking it was a great idea to read at our eco- party next saturday for Earth Hour. Im glad I read your article today so I can explain about tyvek to the parents. I work for a nonprofit group that is putting on an event for Earth Day called “Creative Reusable Bags.” We will give out free reusable shopping bags made from 100% polypropylene (PP or plastic #5) to children, teens, and families at our event to be decorated with paints, fabric, buttons, and markers. Participants will sign a pledge promising to use the bags for shopping needs instead of using paper or plastic bags. I am floored for the event and am so happy you chose to write about this book, as I have never seen such a book for kids. Thanks for the article, and keep up the great blog! P.S. If you would like more info about our event in OC, feel free to email me! I will also add a link to your site really great information thank you!